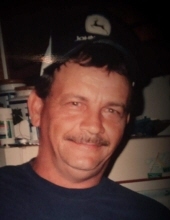 John Russell Lee Earwood, 55, of Locust Grove passed away on Saturday, March 16, 2019. He was born on October 4, 1963 in Osceola, Arkansas to Mary and the late Bobby Earwood. Russell was preceded in death by his father, Bobby Lee Earwood and his brother-in-law, Joe Johnson. He is survived by his wife, Connie Earwood; daughters, Haley Earwood and Brittany Earwood; son, John Earwood, Jr. and Audrey Earwood; seven grandchildren; mother, Mary Earwood; sisters, Libby and Ray Ellison, Cindy and Tim Ellison, and Joyce Johnson. A memorial service will be held at 2:00 PM on Thursday, March 21, 2019 at Panhandle Baptist Church, Hampton, GA.
To send flowers or a remembrance gift to the family of John Russell Lee Earwood, please visit our Tribute Store. "Email Address" would like to share the life celebration of John Russell Lee Earwood. Click on the "link" to go to share a favorite memory or leave a condolence message for the family.